The 27 Club; Myth or Maybe? Side note – Originally the title for this blog post was supposed to be; ‘To Blog or Not To Blog’, pretty self-explanatory but I had this idea of creating a post to just address the fact that I have recently been very conflicted with creating blogs (isn’t it ironic, don’t you think?). Writing is something that I really enjoy doing and I would never have started to write blogs (especially blogs that would be published for everyone to read), if it wasn’t a requirement for my final year PR coursework. For this PR work I had to write a series of 3 blogs, incorporating both PR and personal interest, I actually would’ve been quite happy if we had to complete 10 posts as it is work that I just thoroughly appreciate and benefit from in many ways. Once the coursework was complete, I stopped writing. However, there have been quite a few moments where I have been reading a story or article, listening to music or just watching the news and thought; I could easily write an interesting post about this, especially if it is something that fascinates me! Of course, personal interest posts are what I revel in, I do enjoy PR related writing; and I am still very much a beginner in that area but it is something I do hope to continue. Soooo, my apologies if you weren’t interested in any of that, but here goes a personal interest post (which very few of you may actually find interesting in the slightest). ‘The 27 Club’; have you heard of it? if not let me tell you a little of what I know. The 27 club or the Forever 27 Club, was the collective name given to the group of iconic musicians and actors who all passed away at the young age of 27, more often that not this was due to drug and alcohol abuse or violence-related incidents. Although the causes of death are rather varied, does this mean there are no patterns? no connections?, you have to admit; it is a little coincidental. So, if you would like to know which famous names will be forever 27, keep reading; Jim Morrison, Jimi Hendrix, Janis Joplin, Brian Jones, Kurt Cobain, Amy Winehouse, Richey Edwards, Ron ‘Pigpen McKernan, and more. Personally, when I first heard about the idea of The 27 Club I was immediately hooked and just had to find out more, a deeper meaning; it was all so strange. Is the curse of The 27 Club more than just an unsettling trend? How many more famous names will become associated with this? Are there musicians out there who fear becoming the life claiming 27? (ok that last one was a bit dramatic but shhh). Legend has it that singer/songwriter Amy Winehouse (pictured above) had actually predicted that she, too, would join The 27 Club. Has this myth been talked about so much that it has actually become… dare I say it; GLORIFIED?! There are many different conspiracy theories that circle the internet today in relation to this coincidental series of events, all ranging from ‘illuminati’, deals with the devil, and even the curse of the white ‘Bic’ lighter (stay with me on this, it’s going somewhere I promise). 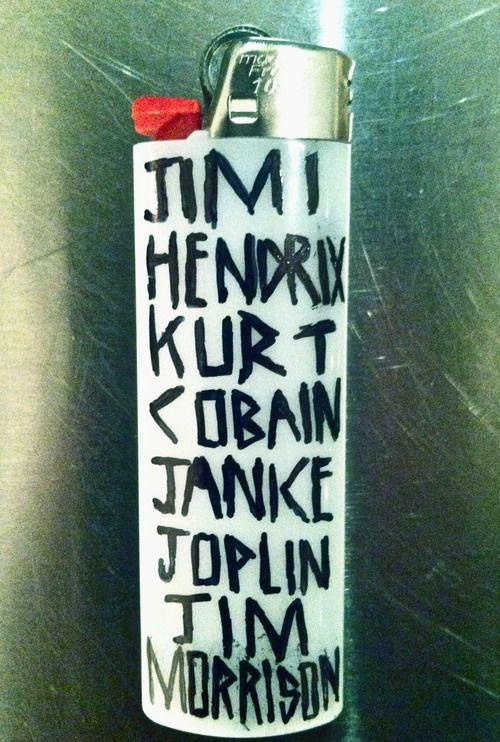 It had been reported that during the autopsy of a number of these celebrities, a white Bic lighter was found in their possession, and of course immediately these lighters were then said to be unlucky. Maybe you’re even reading this thinking it’s all a load of rubbish; but I can almost guarantee that the next time you happen to come across a white Bic lighter you will remember this post (probably not but that’s the dream, eh?). So, was it a case of live fast, die young? all in all there is not much evidence out there to support the fact that this is anything other than a peculiar coincidence, I mean; Bic’s disposable lighters weren’t even produced until 1973, a considerable amount of time after many of these famous deaths. Jim Morrison did famously once say; “whoever controls the media, controls the mind”, something to ponder over. (Maybe he was warning us, ok I’ll stop). Still, quite a cool theory though! The 27 Club is something that I have known of and thought about for quite a while, maybe this is your first time hearing about it, perhaps you even know more than I do… and although this is likely to be some congregated idea of theories and fantasy – the next time you hear of a musician passing away at the age of 27, it just might send a little shiver down your spine! “Warm and welcoming is who we are”… is it really? The events that took place on the 9th of April 2017 at O’Hare International Airport may suggest otherwise. 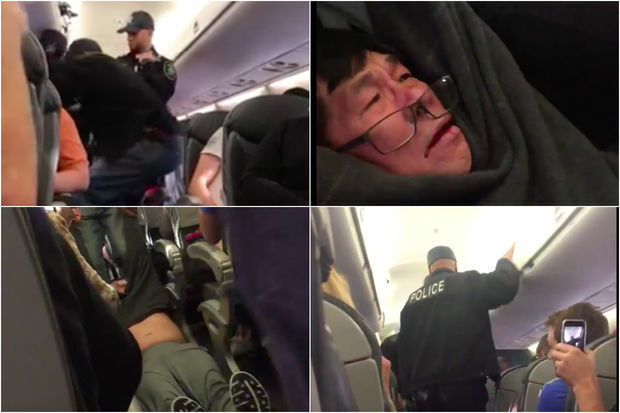 If you do not remember the incident, allow me to refresh your memory; a passenger who was travelling with United Airlines was forcibly ‘dragged’ off the plane by two security officers due to what some may refer to as ‘a common seating problem’. However, this ‘common’ problem quickly turned into an unnecessary act of violence. The passenger who was later named as; David Dao, 69, was returning from a holiday in California with his wife when the incident occurred. Rather vivid footage of the event flooded social media and news channels in the UK as well as the USA shortly after it took place – a PR nightmare for any large company as we all know how fast word can travel in this day and age; especially news as scandalous as this. Since the incident, many discussions have taken place regarding whether or not the passenger should have been removed in the manner that he was; mainly due to the fact that he refused to give up his seat once the airline had requested 4 of its passengers to vacate the plane in order to have seats available for 4 of its staff members. Could this have really been a fair argument after this footage? The images shown above are quite shocking, once the footage went viral there was nowhere for United Airlines to run and hide; the proof was clear. Is it ironic that the month before this incident happened, United Airlines CEO Oscar Munoz was named US Communicator of the year by the magazine; PR Week? this was apparently awarded to him for his outstanding communication skills under pressure and ability to ‘engage with employees and customers’, maybe a little too much? It had been said that the airline obtained the right to forcibly remove passengers where it was deemed necessary, although, only after the appropriate steps had been taken. In which case, the passenger would have had to have been arrested before any physical action should have taken place. The evidence was clear and there was no denying what had happened, so what could the airline do next? blame the passenger of course, CEO Oscar Munoz stated that the passenger was “disruptive and belligerent”, but this cannot justify causing said passenger to end up hospitalized following a concussion and several other injuries, can it? The immediate response from the airline sparked outrage amongst the public, not helping their image in any way whatsoever, if anything, just making the situation worse for themselves as this initial statement did not include an apology. Not only was there no apology issued straight away, but the CEO then continued to praise his employees for their performance, claiming that they went “above and beyond”. Once an apology was eventually made, the blame was then passed onto the airline’s policies, again proving that this scandal was not handled in the best of ways. Is there really no such thing as bad publicity? this image may suggest otherwise, perhaps the airline deserves this kind if backlash for their mishandling of the situation. United airlines had already been a hot topic with the public after refusing to allow two teenage girls to board a flight because they were wearing leggings, this incident alone attracted an abundance of criticism, the smart thing to do after this would be to lay low for a short period of time and stay out of the news, but it seems United Airlines were eager to stay in the headlines. Maybe the scandal has had a positive impact for the airline in the long run, in terms of more publicity, although, it cannot erase the damaging name they have created for themselves. In my opinion, and I’m sure in the opinion of many others; not enough crisis management tactics were implemented in terms of; the first few minutes being critical, taking responsibility, sensitivity to victims and families, and having a PR director on the crisis team; maybe this incident could have had a slightly better and less damaging outcome for the airline. All in all, this is hopefully something they can learn from and aim to prevent in the future – perhaps one small positive out of one large catastrophe! We all know that come October time the Christmas TV advertisements begin to make their way onto our screens, perhaps a pleasant reminder that the festive season is upon us? or perhaps not in some cases. Each year, large companies, department stores, food and drink brands, retailers, and many more launch their Christmas campaigns. But my question is; is the secret to a successful PR campaign really tapping into the emotional side of things and pulling on the heartstrings of the public? I honestly don’t think there is one answer to this question, however, that doesn’t mean we can’t have a little chat about it here, eh? From M&S to Guinness, John Lewis to Iceland, and Aldi to Boots; we’ve seen it all. I guess it’s a good time to insert a little disclaimer here that I, personally, love emotional Christmas advertisements, especially the tear-jerkers! Does anyone remember the Edeka 2015 ad? Of course you do (if not please see below for reminder) it was the Christmas ad that hit home with, well, just about everyone. Are these campaigns more effective than, say, feel-good Christmas ads? they may be more memorable that’s for sure. Of course the same factors still apply when producing a Christmas campaign; reaching the target audience, credibility, creativity, persuasion, and so on. This is where advertising and public relations become one, with the shared goal of convincing the public that they are in need of something or interested in a particular product which they would otherwise pay no attention to. It’s all about the appeal, emotional appeals automatically grab the attention of the public, as a way of ‘hooking’ them in, a very strategic way of advertising. In a way, this is a brief dissection of the makings of our favourite festive TV ads, but know it is not my intention here to ruin the magic that is Christmas advertisements, so please don’t stop scrolling. Please. The idea behind the emotional appeal is knowing how the public will react, and what better time of the year than Christmas to do so? Each year, new advertisements are released; all with the intention of topping the last and competing with each other. For example, John Lewis are renowned for their Christmas TV ads, every year there is such anticipation circulating around what will feature in the advertisement and will it be a happy or sad one? Whatever they may be, they certainly always have us feeling warm and festive inside. Yes, they do! Just agree with me. We all know the ‘happier’ Christmas ads, i.e. ; Coca-Cola, Marks & Spencer, Sainsbury’s, and Guinness (personal favourite). But are these really the ones that stick with us? The ones that we remember? It’s the Christmas ads that have meaning behind them, the ones that make us stop what we are doing and look at the TV, even if we are not watching it, the ads that make us look around and appreciate our homes and our loved ones, essentially, the ads that proclaim the true meaning of Christmas. Taking the emotional approach is a smart way of sending out a message, to ensure it will be received and listened to, however, with the more light-hearted advertisements; it is the rational appeal that is implemented, this addresses the more practical side of things, for example; Iceland advertising their Christmas offers and deals on party food, or Argos promoting certain products, and even in some cases; both appeals may be used. In my opinion, nothing is as effective and powerful as a sad advertisement let alone a Christmas one. I think it all centres on the music, adding an emotional song to an advertisement can really resonate with some people and therefore makes music a very significant feature for these types of campaigns. A great example of this is the John Lewis Christmas ad back in 2012 when the song ‘Power of Love’ by Frankie Goes To Hollywood was featured, there was something very haunting and moving about it, enough to bring a tear to one’s eye (yes ok, my eye). Please watch the clip below to find out for yourself, you may well remember this ad, it’s for sure one I haven’t forgotten. So is the secret to a successful PR campaign using emotion? all in all I guess there is no right answer here, but what we have discovered is that the emotional appeal to the public has certainly been beneficial, it has proven to be extremely effective, I mean, you can see for yourself on YouTube just how many views each of these advertisements has, whether this is down to how touching they were, the music featured, how powerful they were; we will never really know. So take the time and watch the next Christmas ad that appears on your TV, can you relate it to this post? I’ll leave you with that thought. “Even I don’t wake up looking like Cindy Crawford” – Cindy Crawford. The 90’s was an era of double denim, sheer dresses, and defined cheekbones. Who could forget those famous faces of the catwalk back when supermodels had to actually work to achieve that desired ‘heroin chic’ look? (ohh how controversial). As Kate Moss once said; “it’s a sin to be tired”! So is it fair to say that our ‘supermodels’ of today are really, well, supermodels at all? The ubiquitous rise of Instagram has introduced us to these perfect ideas of how we should look and how we should live our lives. We are constantly scrolling and observing, following celebrities and monitoring every little thing they do. Don’t get me wrong; I, myself have become a victim of social media scrolling – I mean, have you seen Kylie Jenner’s 20ft rose gold and blush pink Christmas Tree? Wow. The argument of ‘insta’-made models vs supermodels has been brought to light in the past and is something that has always grabbed my attention because of the admiration I have for the originals. Whether you are also in awe of these women or simply couldn’t care less, you will without a doubt know their names. I now introduce the OGs of the modelling world; Linda Evangelista, Claudia Schiffer, Helena Christensen, Kate Moss, Christy Turlington, Naomi Campbell, Cindy Crawford, Carla Bruni, and Stephanie Seymour. Each one as iconic as the other. So, is it fair to say that without Instagram our little darlings would be nowhere near as popular? As the great Bob Dylan once sang; the times they are a-changin’. We’re now in a different era, one where social media has completely taken over and everything one does must be documented for the world to see. Kendall Jenner then hit back at the supermodel’s comment by simply saying “if you’re going to tell us not to be in “your moment”, then don’t be in mine”, ok which is fair enough, right? You have to admit that the models of today would not have the same following without Instagram, so much so that it has become an app associated with perfection and this idealistic view of the world. Below you will find a picture that Kendall Jenner posted on her Instagram page which received a massive 2.7 million likes. In a way, this kind of publicity cannot be compared to supermodels having to create a name for themselves from scratch, working tirelessly for fashion shows for major names such as: Versace, Gucci, Calvin Klein, and Marc Jacobs; being recognised from television advertisements, fashion campaigns, and celebrity endorsements; without the assistance of Instagram. At just the touch of a screen, hundreds of perfectly polished photos will appear of our modern-day models. Long gone are the days of being discovered at an airport at the age of fourteen, or in a nightclub at age seventeen. (Kate Moss & Claudia Schiffer). For me this has always been an interesting topic of conversation, and one which really does not have a right answer. The rise of social media is something I have been studying as part of my dissertation and so I understand pressures and expectations in the online world. Of course we can’t blame these models for taking advantage of this kind of publicity, although, the question here really should be; is the ‘supermodel’ now a thing of the past? One thing for sure is that they will never be forgotten. Well, not if Donatella Versace has anything to do with it. The fashion designer gathered five of the big names together for a catwalk tribute to her late brother Gianni Versace on the 20th anniversary of his death, the models walked down the runway to George Michael’s Freedom! 90′, the same music video they starred in all those years ago. If you’re someone like me who is just amazed by these models, even today, then I would strongly advise you to watch the clip and then agree with me that it was truly something special.